Run Hard, Run Fast, Have Fun. Those were my goals for my first competitive 5K today. I’ve done a 10K, a half marathon, and lots of road running not really training for anything, but today was my first actual timed 5K. Since I started training with an actual running coach, everything about running has been different. The how (yes, I still put my shoes and clothes on. . but the how is VERY different! ), the why–I was definitely a stress-runner before, I ran for ME, to get the stress out and to be able to clear my head, and when training, you have to pay attention– were just very different. That’s training vs running I guess! So all week, I’ve been worried about this race. What should it feel like? How fast should I run? How fast COULD I run? Was it going to rain? Was I going to be the slowest one with the team of athletes that my coach is training? Not having done a 5K, I had nothing to compare to. Nada. So therefore, bring on the anxiety! What did I learn? 5Ks are hard. Probably won’t be my go-to race! I ran hard. I ran faster than I’ve every ran in my life. I had fun!! It wasn’t raining which was SO good. I finished strong. When I turned the corner at mile 3 and could see the finish line all I could think was “I just want to be DONE!” I managed to dig deep and find some energy to pick it up the last 0.25 or so miles. I averaged a 8:25 pace, and finished in 25:58!! The first mile was 8:15 pace. EIGHT FIFTEEN! Wow. According to my coach, this was the “pre-test” for winter training. After taking off 4 months after being injured and just starting to run with Nick and Tranbarger Training Systems in September, I’m feeling pretty excited about what the next few months are going to bring. I knew if I did well today my workouts for the next few months will be hard. I want them to be hard. I want to push myself and finish the Mini in May under 2 hours. That is a lofty goal, and one that I will have to continue to work hard to accomplish. For today, I’m thrilled with my 3rd place overall female finish, and PR of 25:58 for a 5K and 8:16 for a mile. As Nick likes to say. . “Onward and Upward” It’s only going to get better from here! 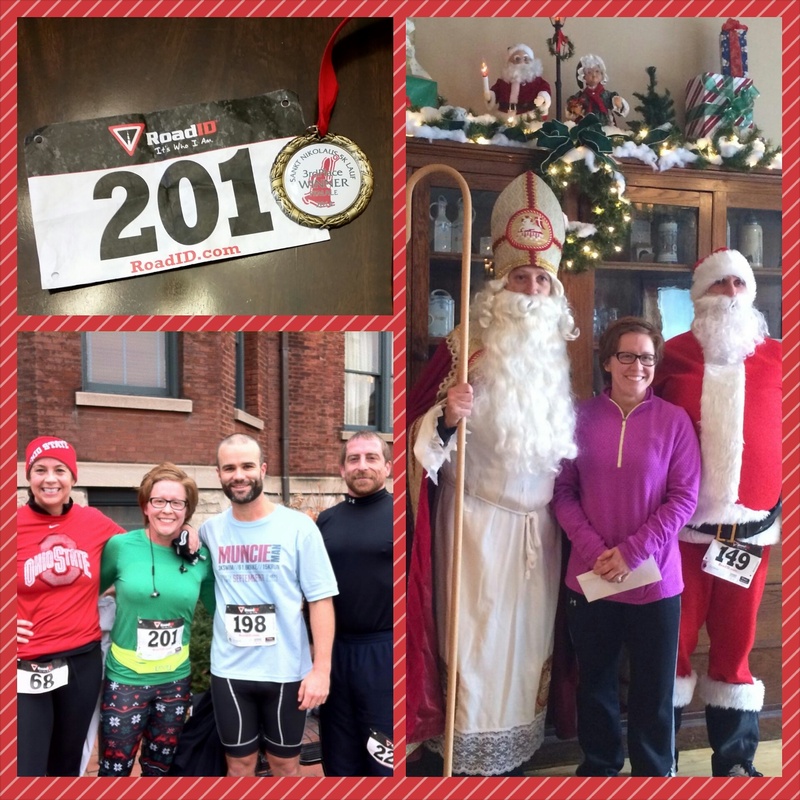 St. Nikolaus Lauf 5K Downtown Indianapolis, IN at the Athenaeum. So wow! October is over! How did that happen!? October was a very crazy month. At the end of September, I was “over-training”. I am still coming back from my injury, and accidentally apparently told my coach I was ” running 5-6 days a week” when in reality that is what I wanted to be running, not where I was currently! Oops. By week 4 of September, my everything hurt. Knees, hips, IT band, ankle, feet, ALL of it. And I’m not a complainer, really. But when it got to the point where I texted my coach and was like “yeah, I’m done, all my everything hurts” , he said “Yeah. . not supposed to be this way at week 4ish of training!! So I went from running 6 days a week down to 5 (wow an extra rest day makes a TON of difference!) and he decreased my mileage. Fast forward to middle of October. I am still shocked at how many miles I’m getting in. And it’s only October. At this stage of the game, I’m building a base, and really not doing any speed work, but everything is still HR based. While at a friend’s house in Illinois, I realized I’d forgotten my HRM. As luck may have it, she had an extra!! WEEE! It was a hard Polar strap. Off I went wearing her Polar strap, and 2 watches. . in the coolest weather I’d run in so far this year. It was AWESOME!! Can’t believe how much my erratic HRM was effecting my run!! Needless to say, as soon as I got home, I Amazon’d a new HARD Garmin strap. Works like a charm. Seriously. So awesome. Has taken a huge stress off my running. The very last week of October, my Aunt was killed in a combine vs truck crash. She was the driver of the truck. Her husband was in the truck next to her, and not a scratch was on him. Also, I had a HUGE deadline at work. . . . .the kind of deadline if you don’t meet it. .you will not have to worry about work any more. This was actually the day after my Aunt was killed. Needless to say, it was great to be able to get out and run that week. Let some of the stress out and get some endorphins!! I’m looking forward to a winter of training. A little worried that I’m going to hate the treadmill more than I thought possible. . .but otherwise looking forward to a new spin on things as being coached by someone else will have. Also, I will be doing a 5k on December 2nd. .so think of me that day if you can!! Mileage Recap for the last few months is below. 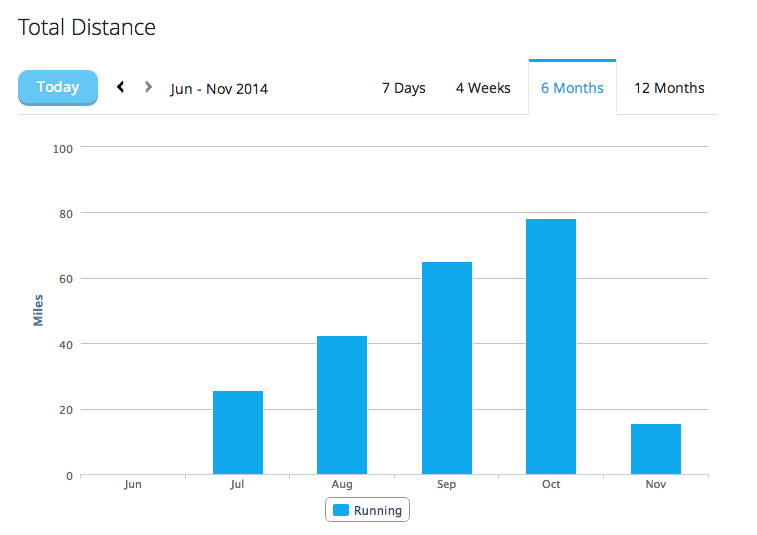 Crazy for me to think I had zero miles in June, and now by November I’m almost at 80 miles in a month. Woah. And Nick of Tranbarger Training Systems is telling me the blue bars are just going to get taller. . .
For real! Look at those numbers!! Week 3 was rough. Not so much physically, but mentally. I did almost 17 miles again. I was feeling like 6 days a week is a lot of time, and then thinking about doing this for the next 9 months. . . was a lot. There is also a TON of stuff going on with my job right now, which is making it hard at home with a crazy schedule and a lot of additional work that I don’t usually have to do. I started to realize that the kind of running I’m doing now is different in a few ways. It’s “active” running. Before, when I was ready to go out on a run, I put my headphones in, thought about how far I was going to go, about how long it would take me, and off I went. As I was running, I wasn’t thinking. I was totally zoned out, and thinking about life, the grocery list, what meetings I had tomorrow, how the kids were doing in school, etc. Not about what my body was doing while I was running. Now, I have to think about what my body is doing, how I’m feeling, where my HR is, etc. It’s a much more active process. I can’t just “click off” my brain. When I do that, I find that I’m not paying attention to what my body is doing. .I just start going and look down and then I have to catch up. Not good. So learning how to run “actively” is interesting. My right kneecap (the top) is starting to ache. I’m fairly certain after a couple of runs paying close attention; that it’s my shoes. I need a 2nd pair of shoes. I might go and try some on this weekend, and try to decide if I’m going to stick with the Asics Tri Noosa 8s (they are still available on Amazon. .I would then have THREE pairs of the same shoe lol!) or do I want to try the Tri Noosa 9s or something totally different? Those are some of the things I thought about last week. Stay tuned for the Week 4 update! I survived Week 1!! Yay! 14 miles complete this week, 6 days of running. •Writing the calendar down or printing it out. So I look at it before each run. I ended up shorting myself a mile on Saturday because I didn’t look at the calendar before I went to run. Oops. I think I’m going to put a calendar with my training schedule on our bathroom mirror where I can easily see what I’ve done and check off the workouts as they are complete(who doesn’t love to mark things off a list!)! • To be helpful, technology must work. My Garmin is awesome. However, it’s never accurate for me on the treadmill. I think I need a footpod, it may be because my stride is short due to the fact I have a 27 inch inseam. Also, my HRM is acting crazy. I know while running a 11:45 mile, that my HR is not 70. I’m no Lance Armstrong!! Going today to get a new battery and some conductivity gel and hoping that fixes the problem. •Trying to restructure an old habit (as opposed to starting a new one) is harder when you are away from home. Traveling for work is hard enough. Traveling out of the country, and trying to start a new habit while working is not fun either. Now that I’m home. . I have to start a new routine again!! • I like knowing I have to be accountable to someone. Nick is making me log all my runs at logarun.com. I’ve never used this system, and am still getting used to it. But the fact I have to account for each run makes it easier to get motivated to do them! •I still love running a lot and I’m so glad I’ve been able to get back into it after my injury. When I was injured, I was really afraid that I wasn’t going to be able to run the way I wanted again. I didn’t know if there would be any lasting tendon/ligament issues. Thankfully, so far it’s going well!! Looking forward to what the next few weeks will bring. I’m in the “aerobic build” phase of training. . I think that is fancy-talk for “going easy on me in the beginning” ! 2016 Recap and Hello 2017! feel-planet.com on Week 2 Training Recap! Coach Nick on A Year of TS2 Coaching. That girl. Yeah, that’s me.